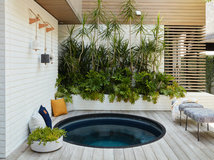 Designer Kristin Siefkin hadn’t even seen the interior of her latest project when she started designing it. 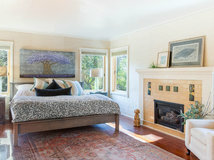 When her clients, a professional couple with two school-age children, upgraded to a larger family home last summer, they couldn’t take possession for several months. 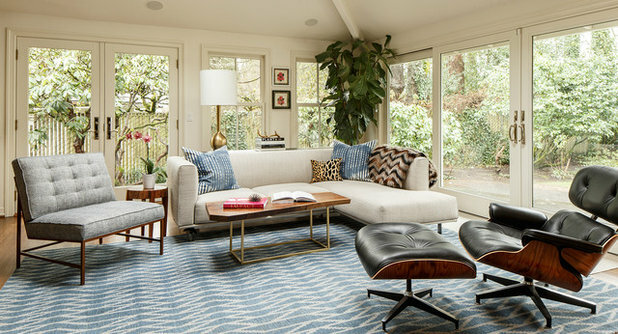 Undaunted, Siefkin used floor plans to work out the fundamental decisions that would result in a midcentury-inspired great room where the homeowners would spend most of their time. 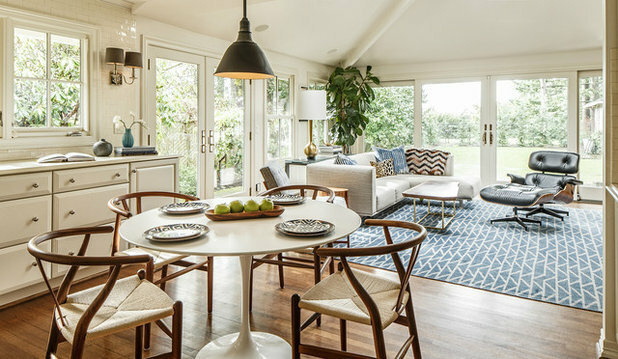 Today, the bright and bustling great room is a functional and stylish space in which this young family can hang out, eat and entertain. Every now and then, a house hunter is lucky enough to find a home that needs only a few cosmetic updates. Siefkin’s clients were just that lucky. The home they purchased for their family was in great shape, with previous updates that included vaulted ceilings and skylights, features many traditional ranch houses don’t have. That said, the home’s layout is a bit unusual in that you have to walk through the center of the great room’s seating area to go outside, so Siefkin had to make sure to leave a lane large enough for people to pass through. 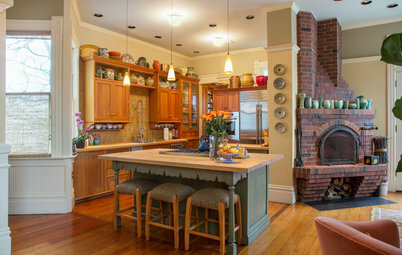 The biggest challenge was to make the space feel cozy while keeping it functional. 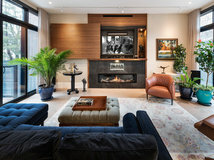 Since the owners intended to spend the bulk of their time in this room, they wanted it to be open and comfortable and to reflect their interests. 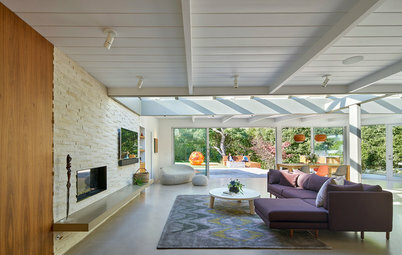 One such interest was design itself: Both husband and wife are midcentury-modern enthusiasts. 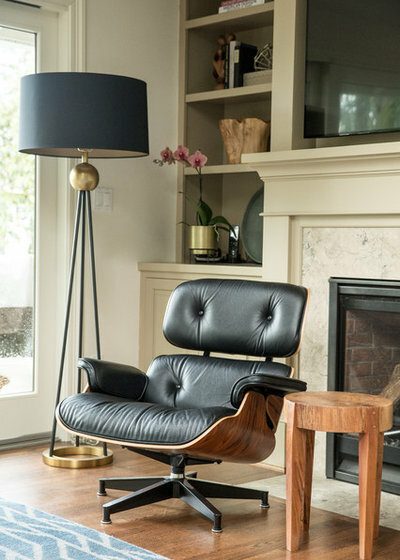 Incorporating their vintage Eames lounger in the room’s design was important to them not only because the chair is aesthetically beautiful, but also because it happens to be the husband’s favorite chair, where he likes to hang out, watch TV and play with the kids during his downtime. The wife loves hot pink, so you’ll see little touches of pink throughout the room. The sectional from Design Within Reach was one of the husband’s great loves during the furniture-buying process, and its tailored lines benefit from being surrounded by tiny pink details, like the artworks on the walls, which were painted by the couple’s young children, and the potted orchid on the side table. 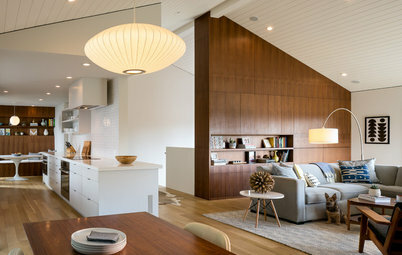 Living in the Pacific Northwest, where it’s often dark and gloomy, the homeowners wanted to keep their living space light and bright, so they kept the walls white and chose a light fabric for the sectional. The homeowners trust their children to be respectful of their surroundings, but Siefkin also took care to select fairly hardy decor. The custom rug, from Grit & Ground in New York, is 100 percent wool and easy to clean, with a low pile that’s easy to vacuum and won’t hide quite as many kiddie crumbs as a shaggier rug would. Its distressed look eliminates concern over wear and fading. Plus, when all else fails, the kids have a playroom downstairs where they can make all the messes they want. 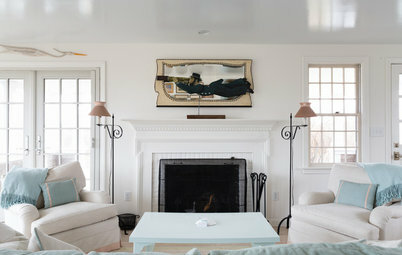 The room is furnished with a mix of custom and ready-made pieces. The coffee table is a custom design by Dylan Design Co., made to dimensions supplied by Siefkin. 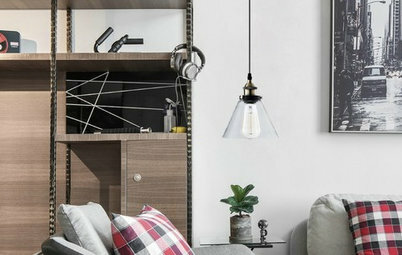 Much of the supplemental furniture was planned around the sectional: Because it is so low-profile, finding sofa tables of the right height was a challenge. In the end, they customized Room & Board offerings to fit their height specifications. If Siefkin has one rule of thumb for creating a truly personalized nest, it is to use original art, even if your kids are the artists. 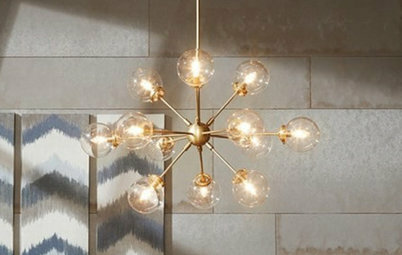 “Original art is so much more personal,” she says, and for that reason, Siefkin believes that it should be selected by the client rather than the designer whenever possible. In this case, the homeowners already had these adorable floral paintings from their children. All Siefkin had to do was validate the decision to display them in the main room of the house. 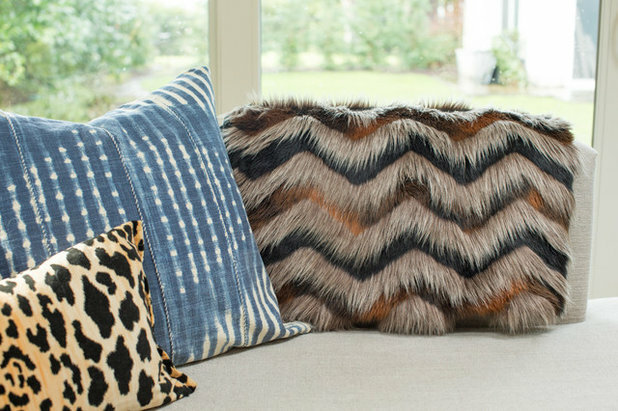 These pillows and the furry chevron-patterned throw typify Siefkin’s blending of midcentury modern cues with current trends. 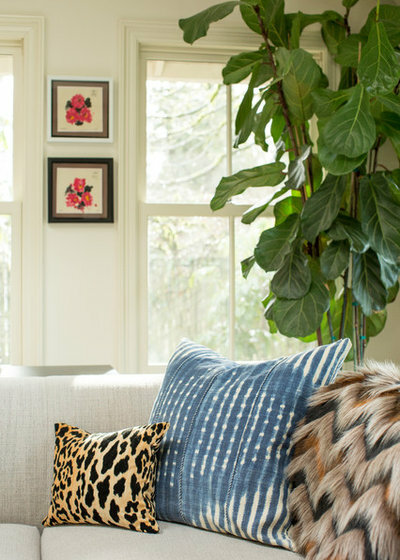 Animal-print and indigo textiles are popular elements of the collected, bohemian look that is so popular today. 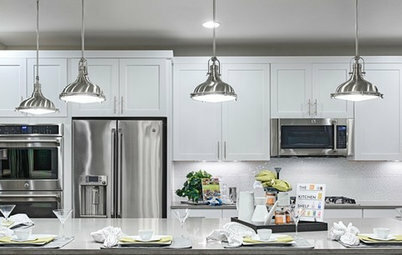 The adjoining kitchen was already quite functional and attractive; they didn’t even have to change the light fixtures. 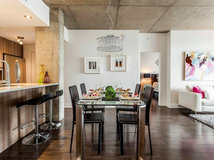 The designer’s primary task was to add the kitchen table from Design Within Reach, the four Wishbone chairs from Rove Concepts and the affordable bar stools from CB2. 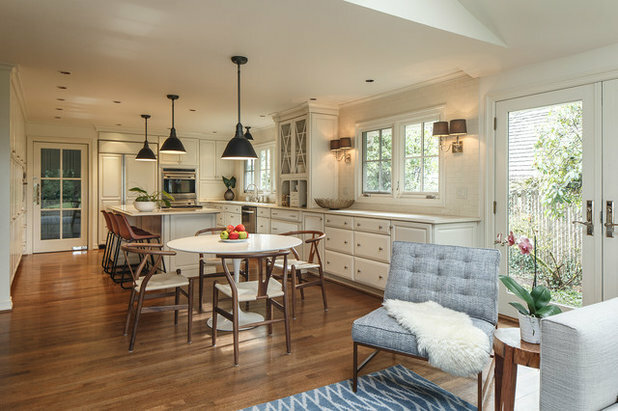 The armless chair that bridges the kitchen and the living space is from Mitchell Gold + Bob Williams. 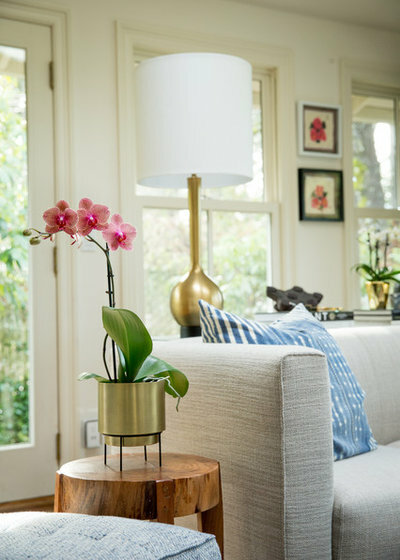 Can you please share with me where the coffee table is from? Thank you. 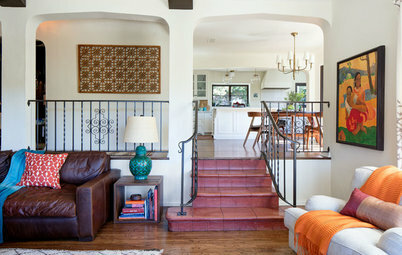 @cvfraser -- the table is from Dylan Design Co. There's a link to his work in the story. @kqjeske It's from Mitchell Gold + Bob Williams. Great job. Love the interior. 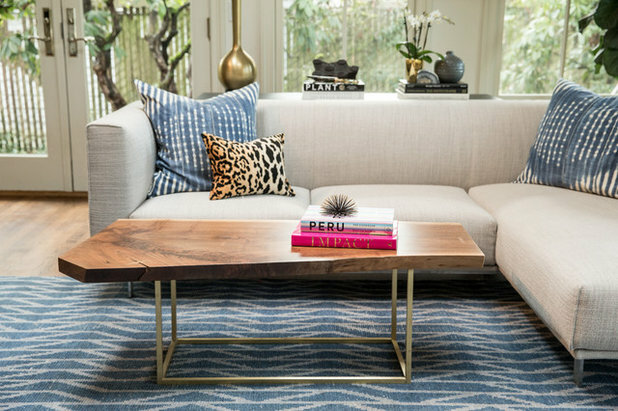 Like the coffee table and rug.